Birdfoot violets thrive in dry places. They are named for the deeply cut leaves, which look like birds' feet. The flowers are large and showy, with an orange "beak" in the center. Mid-May is prime time for violets, with different native wild violets blooming in wet and dry places in Westborough. At one extreme, marsh blue violet (Viola cucullata) grows in wet, swampy environments. These blue violets look very much like the common blue violets (Viola papilionacea, Viola sororia) in our lawns and gardens. But there are differences. The flowers of marsh blue violet stand tall above the leaves, well above the soggy ground, while the flowers of common blue violets are usually barely taller than the leaves. Marsh blue violet flowers often have a darker blue at the center of the blossoms. But the most noticeable difference is where marsh blue violets grow - in swamps and marshes, as the name suggests. Keep an eye out for marsh blue violets in any wet field or swampy area. At the Headwaters Conservation Area (HCA), look for their blossoms in the swampy area on the Mill Pond side of the trail, just opposite the vernal pool on the way to Osprey Point from Andrews Street. Marsh blue violets bloom there most years. Marsh blue violets grow in swampy spots. Their long stems hold the flowers high above the leaves, and the flowers are often darker blue near the center, like this one from the Headwaters Conservation Area. Another area to check is the edge of Crane Swamp trail, on the Crane Swamp side. Go along the trail from the Lyman Street east entrance to the Westboro Wildlife Management Area, on the east side of Lyman Street, near the state hospital transportation grounds. 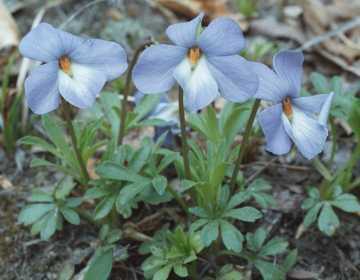 At the other extreme, birdfoot violet (Viola pedata) grows in dry environments. These violets look so different from our familiar common blue violets that it might be hard to recognize them as violets at first. But for lots of people, these showy violets are the most beautiful of all. Birdfoot violets have relatively large blue blossoms with a bright orange "beak" sticking out of the center. (The stamens – the pollen-producing male flower parts – form the beak.) Sometimes birdfoot violets bloom twice, first in May and then again in September. 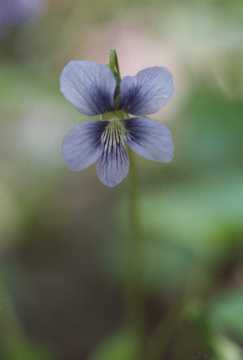 Unlike most other violets, birdfoot violet has deeply cut leaves that bring to mind birds' claw-like feet. These unusual leaves give the plant its name. It's also sometimes called crowfoot violet for the same reason. Look for birdfoot violet in dry or even sandy places. It's a plant of dry uplands, unlike most violets, which favor moist environments. It grows in some backyards on Flanders Road, on the side away from Cedar Swamp. Look for it at the Headwaters Conservation Area, especially near the beginning of the trails that lead into the woods from the playing fields at Mill Pond School. It also grows in parts of the field near the Andrews Street entrance to the HCA. It's also in the Westborough Community Land Trust butterfly garden there, where you might find it in bloom in the fall. Speaking of butterflies, it's no accident that violets are featured in butterfly gardens. Not only do violets bloom early in the season, providing nectar for bees and butterflies, but they are also important in the lives of certain butterflies. Violets are the food plants for caterpillars of fritillaries, which are large, lovely orange-and-brown butterflies of summer (not to be confused with monarchs and viceroys). They include the great spangled fritillary (Speyeria cybele) and Aphrodite fritillary (Speyeria aphrodite). Female fritillaries lay eggs among the grasses in fields during the summer. The fritillary caterpillars hatch later in the season and overwinter in the fields. In the spring they find their way to violets to feed on the new growth before becoming butterflies. In spite of their differences, marsh blue violets, birdfoot violets, and common blue violets all have a special relationship with another insect - ants. It's good both for the ants and the violets. Basically, ants plant violet seeds. Why would ants do that? The short answer is food. Violet seeds have small bumps on the outside that are rich in fats and oils that appeal to ants. The ants find the seeds and carry them back to their nests, where they eat the goodies on the outside and leave the inside untouched. Being the orderly creatures that they are, the ants then discard the seeds in unused tunnels in their nest – effectively planting the seeds. So the ants get food, and the violets get help in spreading their seeds. The seeds end up in new, safe, underground locations where they can sprout. These locations are usually farther from the original plant than the seeds would otherwise land. Violet seeds tend to go shooting out when their seed capsules spring open, but the seeds still land only several inches from the plant. When ants come along, they move the seeds farther away. How different is what the ants do from what we do sometimes, say when we go to a pick-your-own orchard, munch an apple, and toss the core into the woods? Not very different! Food lures both ants and people into the service of plants. As it happens, ants plant birdfoot violet seeds more often than they plant marsh blue violet seeds. The reason? Location, location, location. Fewer ants live in the swampy areas where marsh blue violets grow. Today we appreciate violets mainly as decorations, but people have long used violets for food and medicine. Violet flowers contain sugar and pectin, so they have been candied and used in gelatins and as a food dye. The leaves contain vitamin C and vitamin A. Young leaves have been used in salads and as soup thickener, and dried leaves steeped to make tea. Violets have been used in old-time cough medicines, laxatives, and plasters for skin ailments. From today's perspective, their use in medicines of the past makes a certain amount of sense. We know now that violets, like a few other plants, contain salicylic acid – the main ingredient in aspirin. Historically, violets have been seen as symbols of innocence and modesty. Greeks, Romans, and medieval Christians all had legends involving the violets of Europe and used them in celebrations.